Images embedded within Microsoft Word documents can not be easily extracted. 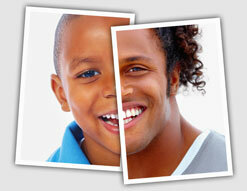 If you simply copy and paste the images, the image quality may get hampered. So what is the quickest and the best way to extract multiple images from any Word document? The trick is pretty simple and straightforward. All you have to do is save the document as a web page. 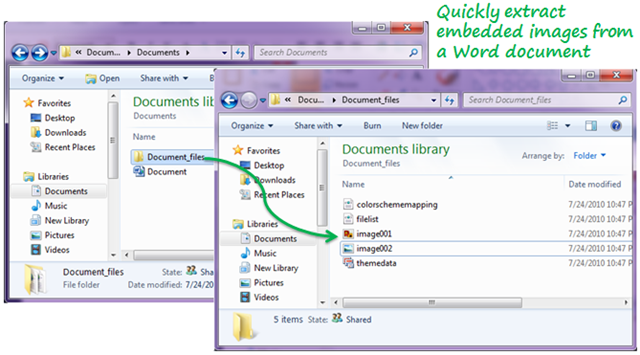 Open the Word document with images in Microsoft Word. Go to File ->Save As. In the Save as type drop down select Web Page and hit Save. 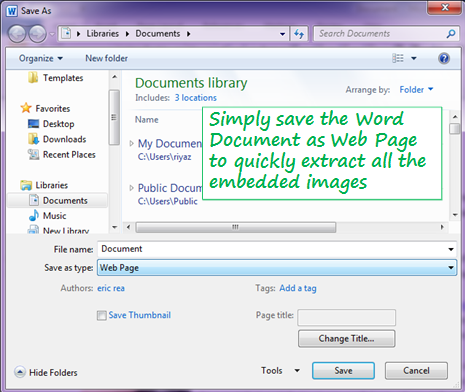 The file gets saved as a web page (.htm or .html) and the images from the document get placed in a folder named <Document-Name>_files in the same location as the web page. 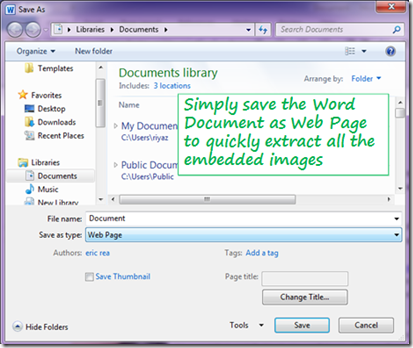 If you want to extract the embedded images without opening the Word document, here is another trick using WinZip or WinRAR utility. Thanks for that great tip. Saved me a lot of time. Do you know any way to do same changes, like masking area, for large number of files. Thanks a lot for this trick Riyaz.You are a life saver.The link you provided is another good trick.Checked out both :).Saved me lots of time.Thanks again. I loose 2 hours to find trick like this….Thank a lot. What about if you change the default setting in Microsoft Word that automatically compresses images when you save? In Word 2007, you click on the picture and then it is in the “picture tools” ribbon, in the “adjust” section, in “options”. I haven’t seen it because I use 2010, but I think it is somewhere there. In 2010 you go “file” ribbon, “help”, “options”, “advanced” and it is somewhere around there. Images are not stored in original size and quality!